Aude M : the French glamour... Classical sterness coped with latin fantasy... In brief Fire under the Ice! Aude M has started dancing at the early age of 4. She attended the famous Nancy's ballet conservatory whilst at the age of 6 ending her academic classes with the second reward at the age of 14. Her training education leads her to practise Modern Jazz but also character and folkloric dances as well. All these being filled up by the practise of piano and songs. Her ballroom dancing career starts when she is 20 with Rock N'Roll, followed by Salsa few years afterwards, Chachacha (and other Latin and Caribbean dances), West Coast Swing (and several Swing dances) at the famous Nancy-Laxou dancing school CAP DANSE, where she will also be teaching for 2 years Rock N'Roll and West Coast Swing. Later in 2011, she joined Big Spenders dancing company with whom she performed 2 shows (Cubauza and Dos Gardenias). Now, she performs a solo show (Ella) and duo shows (Au Crépuscule - a bachata modern - and Ay Jose - a chachacha) with her partner Frantz Kichenassamy as well. West coast swing will have always remained present throughout her career. Thus at What Else festival in November 2010 and the West Coast Swing Dance Festival in January 2011 both held in the city of Romance, Paris, she will appear on stage next to Olivier Rio. Her inspirational, enthusiastic and commitment to Dancing leads her to share some interests for Oriental dancing, 5 Rhythms dancing, Pin-Up Art, Dramatic Body Mime…and naturally the basic body technics as floor barre, postural stretching, Qi Qong, Bikram Yoga. 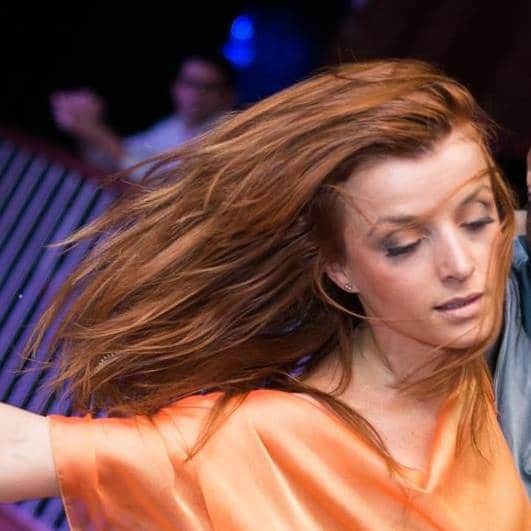 Aude M teaches her passion of dancing the New York Style Salsa On 2 (lady styling, shines, partner work, latin jazz salsa), and the Bachata Moderna style as well. In brief, Aude M is Dancing going to great lengths…!